Reports in the media about the Millennium Water sales challenge and the developer’s financing difficulties have been many; reports from the men and women residing in the new community, few. So, with the help of the organizer of the Millennium Water sales and marketing campaign, the Rennie Marketing folks, we at Westcoast Homes interviewed three Millennium Water owners. They moved to the former Olympic village from very different places. One traded in a huge house in south Surrey, one moved from halfway around the world, and a third — a Canadian senator — moved from a bachelor suite in Kitsilano. “Well, if this wasn’t the Olympic village, you wouldn’t even know about [the sales numbers],” says Senator Larry Campbell, sitting in his one-bedroom home. Here, the walls and kitchen are white. A rare bit of colour is contained in an as-yet-to-be-hung painting of Campbell and former Vancouver councillor and Downtown Eastside activist Jim Green. The project’s developer, Millennium Developments, has had difficulty attracting buyers since the Olympic Games, when the units were home to the athletes. As of Sept. 24, 254 units had been sold — most before the Games — while 483 remained unsold. Another 250 of the units at Millennium Water have been set aside for social housing, but have not been occupied. 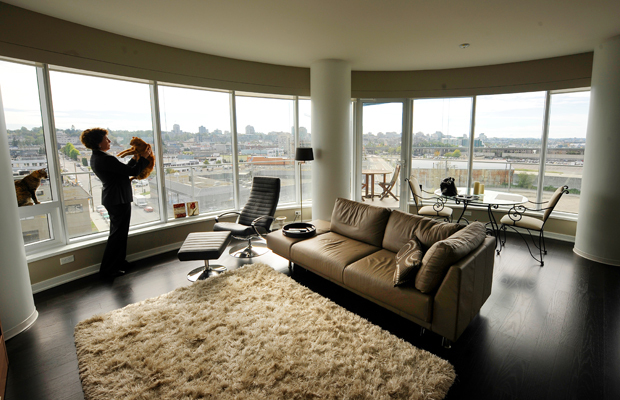 Susan Ewanick, meantime, moved to her seventh-floor, two-bedroom suite from a large house in Surrey. Campbell bought into “the story” of the place, as well. None of these “villagers” have an issue with the costs incurred in making the development a LEED platinum-rated community. Ewanick calls the sustainable features “an added bonus,” while Moore admits that before moving into Millennium Water, the environment wasn’t really on her radar. The owners’ appreciation of those ”green” systems is not just theoretical. As for Vancouver taxpayers worried about recouping their investment, Campbell notes: “They’re not making any more land like this, and they’re sure as hell not making any more buildings like this. The city has a lot of options. It could stay in for the long run and have a potential huge windfall. They could sell a piece of it off, or they could sell all of it off. There are people who are interested. I think that whatever they want to do in the future, what they’ve done in the past is admirable. It was the right thing to do. In the end it’s going to be financially beneficial to the city, no question about it.